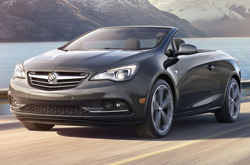 What's New for the 2018 Buick Cascada? The 2018 Buick Cascada is unchanged from the 2017 version in terms of mechanics and design. This year, however, the Cascada debuts three snazzy new color choices, which are an eye-catching metallic red, an alluring dark blue metallic, and an elegant Carrageen metallic. Cascada owners can also choose from two new choices of convertible tops, which allows for more stylish and more personalized look on the road. As with previous years, the 2018 Cascada still has room for four passengers. Its average gas mileage is 21 in the city and 29 on the highway. There are three trim levels offered in the latest Cascada, which are the Base, Premium, and Sport Touring. The base model of the Cascada is simply called the "Cascada." With its solid performance, interior design and amenities, and safety mechanisms, the Cascada is a great deal for its price. Its sporty look also makes it fun to show off on the road. The base trim is powered by a 1.6L, four-cylinder turbo-charged engine. It is matched with front-wheel drive and a six-speed automatic transmission. The base features large 20-inch aluminum alloy wheels and a power-operated soft top. Driving at night and in poor visibility is made safer with adaptive headlights and LED daytime running lights and taillights. The Cascada features heated side mirrors and backup parking assistance. The luxurious interior contains a dual-zone climate control, leather seats, which are heated in the front, and a back row of seats that folds down. 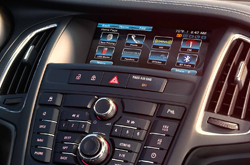 This trim has a seven-inch touchscreen with audio and voice controls. It also comes with a seven-speaker sound system and satellite radio. A rearview camera is a standard component on the base model, and it has an optional OnStar system that has a Wi-Fi hotspot for instant internet access anywhere. Moving up the line, the mid-level Premium has all of the standard conveniences of the base version and more. A new set of safety and tech features are integrated on the Premium. Low-light driving is made easier with fog lights and automatic headlights. Automatic wipers detect and respond to changes in rain. 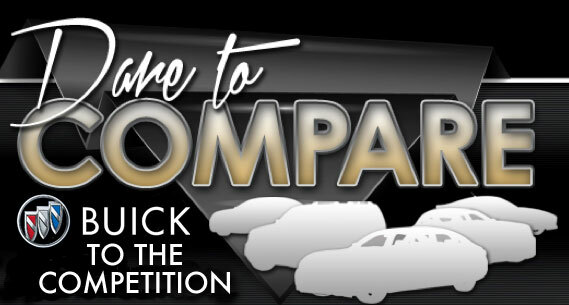 Notable safety additions in the Premium trim are forward collision avoidance, parking sensors in front and back, lane departure warning, air deflectors for all passenger seats, and a more sophisticated navigation system. Custom exterior paint colors are part of the additional offerings for the Sport Touring trim, which is the highest level trim offered in the Cascada. The Sport Touring also gets a distinct set of alloy wheels and an attractive all-black interior color scheme. The Sport Touring also comes standard with a track-like flat-bottom steering wheel, which gives it a sportier look and improves its handling, especially at higher speeds and around tight corners. Special sport pedals make the Sport Touring more responsive and fun to drive. 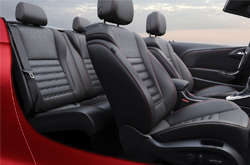 All three trim levels of the Cascada are designed with the same engine and transmission. They are powered by the same 1.6L, four-cylinder, turbocharged engine that provides plenty of pickup and creates a responsive and sporty feel on all types of roadways. The engine, which produces up to 200HP, is mated with a six-speed automatic transmission. All trim levels have a unique sporty suspension system that enhances their traction and improves stability around corners and when traversing uneven surfaces. From highly visible exterior lights to driver warnings and collision avoidance mechanisms, the Cascada is designed to be as safe of a ride as it a joy to drive. Forward collision alert, which warns drivers if they're getting too close to the car in front, is one safety feature on all three trim levels. All Cascada trim levels also come with a lane departure warning, which warns drivers when they switch lanes without activating their turn signals. Front and rear parking sensors are other notable preventative safety amenities.